I got to Dark Souls late (only picked up the first one last year). When I read that it was crazy long and crazy difficult I figured it was something best avoided. I’m all for a challenge, but if the game is really that hard, it couldn’t possible be fun at the same time. I was wrong. Dark Souls walks a fine line between being a satisfying action RPG and a punishing death simulator. It kills you over, and over, and over, and you keep coming back for more. So why is that? Why put up with the punishment? It’s because if any other game did this to you, you’d think there was something wrong with it. 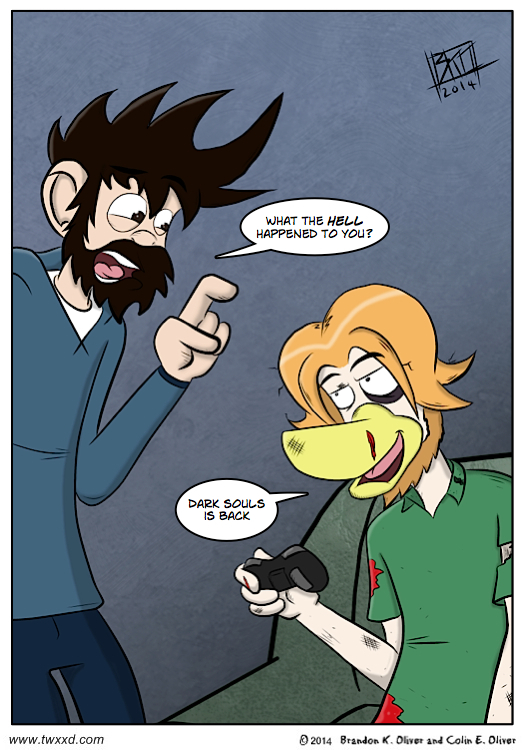 But the genius of Dark Souls, is that it makes you think there’s something wrong with you. It’s not that the game is too hard… it’s that you’re not good enough. Your reflexes aren’t sharp enough, you’re not timing your blocks, you were milliseconds shy of a successful parry… and maybe you could win if you were a better player, so you’d better try that boss a couple dozen more times. I’m not saying it’s rational, but when you finally do get past that part you’ve been working on for an hour, you’re the king of the world. Dark Souls 2, so far, is more of the same, in all the right ways. If you’ve got some time to kill, and you’re feeling masochistic, I highly recommend it. This is one title I missed out on. Your description of it now has peaked my interest by calling it masochistic alone. It really is brutal. But rewarding.